Mitt Romney is launching a bid for the United States Senate. And since he's back on Utah's political scene, trying to reclaim whatever gusto lost him the 2012 presidential election, Romney is doing what any wealthy politician would do: he's talking to the people about meats. A recent article in The Washington Examiner documents Romney's efforts to connect with real, salt-of-the-Earth Americans. Specifically, he's been pandering to their supposed affinity for hot dogs -- a food worthy of votes, apparently. The internet isn't letting Romney get away with this. All day on Friday, tweets have been skewering the Senate-hopeful for characterizing "hot dog" as a meat, among other things. 7. Love? Am I pronouncing that right? 8. Definitely not human, where would you even get that idea? I shall laugh boisterously now. 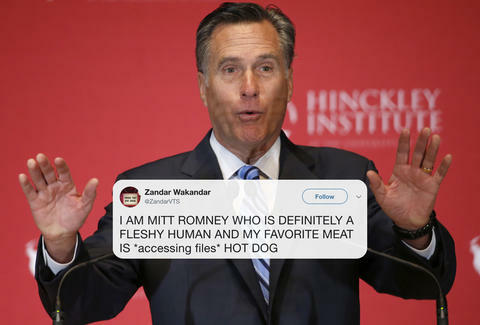 Because I guess I was on the hot dog beat for a few years, I am perturbed by the way in which Mitt Romney refers to hot dogs. He says "My favorite meat is hot dog," he says, which, like, is that even English? Mitt Romney says his favorite meat is hot dog followed by hamburger. Mr. Moneybags is trying way too hard to connect with the all of us commoners. Mitt Romney's favorite meat is hot dog, which he eats while watching sport. Mitt Romney: “My favorite meat is hot dog, by the way. That is my favorite meat." Pretending to love hot dogs more than filet mignon isn't exactly a scandal worthy of incinerating a political campaign, but then again, who knows what is anymore.